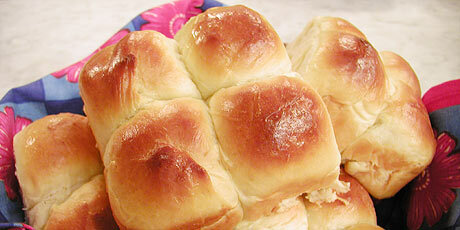 This a soft dinner bun that kids of all ages will love! To develop better flavour, let the dough rest in the refrigerator overnight. Use an 8 x 8 x 2-inch baking pan so that you can pull a part the dinner buns at the table. Makes 16 small dinner buns. 1. In a small bowl, combine sugar with ½ cup warm milk and mix well. Add the yeast and stir. Let the mixture stand for about 10 minutes, until it foams. 3. In the bowl of a stand mixer fitted with the dough hook, combine the flour and salt by hand. Add the yeast mixture and the egg mixture. With the stand mixer, start mixing the dough on low speed. Increase speed as flour is incorporated. Continue to mix until dough comes together. Increase machine speed, knead dough until it comes together. 4. Turn the dough out onto a floured surface and knead for 6 to 8 minutes, adding more flour if necessary, until the dough is smooth and elastic. Put the dough into a large oiled bowl and cover with plastic wrap. Leave overnight in the fridge or alternatively let proof until doubled in a warm spot for 45 minutes. 1. Punch down dough and turn it out onto a floured surface. Tear off pieces of the dough and form sixteen 1 ½-inch balls. Roll them onto a surface to make smooth. Place in a buttered 8 x 8 x 2-inch pan. Let rest, covered, in a warm spot, until doubled in size, about 45 minutes. 2. Preheat oven at 350 degrees F.
3. In a small bowl, whisk together the egg and milk to make an egg wash. Using a pastry brush, generously coat the top of the buns with the egg wash. Bake the dinner buns for about 13 to 15 minutes or until they are golden brown. Serve warm and pull apart at the table. Get your glow on by incorporating these skin-loving foods into your diet. John Catucci is Back — Here’s Why You Gotta Tune in! In his new show Big Food Bucket List, John Catucci is eating his way across North America, one restaurant at a time.